Southern Cooking – Get Cooking! 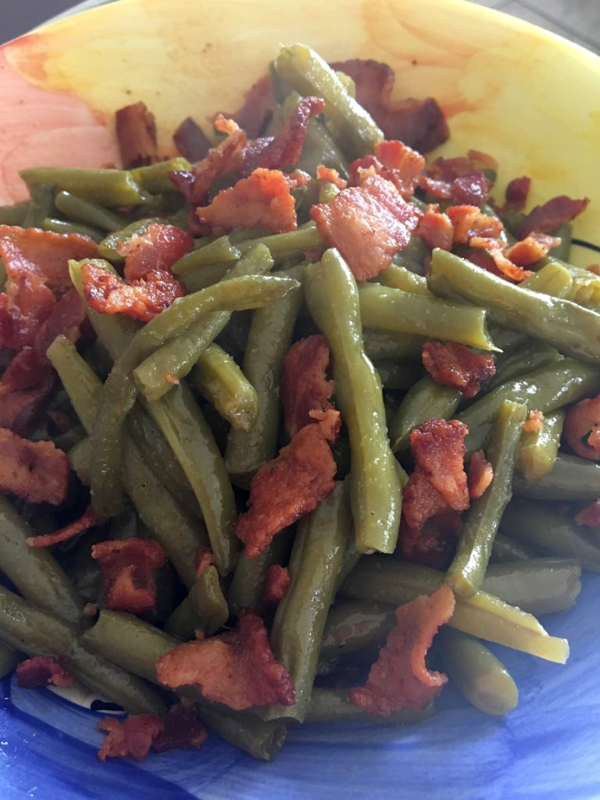 Southern green bean recipes differ from cook to cook – often in the same family! For example, if my grandmother or mom had known I’d one day grow up to put chicken broth in my green beans, they’d have passed out Old-Hollywood-style. But, what can I say? Years ago, when I saw how much FLAVOR adding chicken broth to rice created, I began experimenting and, lo and behold, it adds a beautiful flavor to almost anything. Naturally, if you want to go with all water (as opposed to half water/half broth), go for it. They’re your beans, after all! I love to add a little dash of red pepper flakes toward the end – if you go easy, the heat is barely noticeable. It adds a new level of flavor without setting your tongue on fire. I’ve never tried this recipe with canned beans, so I have no idea how they’d turn out. Buying fresh takes a little more time (since they don’t snip or snap themselves), but it is SO worth it. Fry the bacon until crisp. Remove the bacon (but keep it!) from the pan, reserving the grease. Add the rest of the ingredients to the bacon grease. Reduce the heat to medium-low and simmer for 2 hours, stirring occasionally. When ready to serve, crumble half the bacon on top and gently stir. Place the rest of the bacon on top - you know, for a picture-worthy display! As I mentioned in my last cookbook review, I know they’re coming hot and heavy, but there are just so many to tell you about right now! I’m quickening my pace simply because these cookbooks would make excellent (and much-appreciated) gift ideas for the cooks in your life. 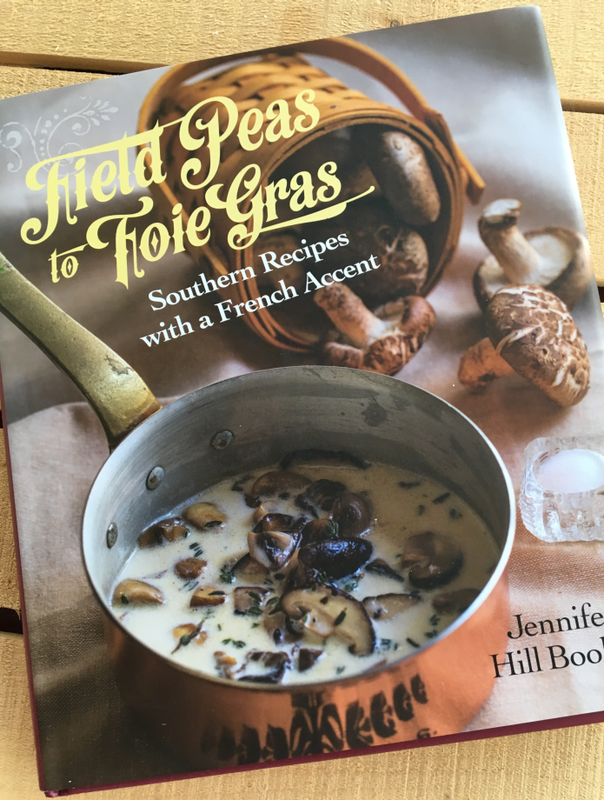 What’s more, cookbooks like the beauty pictured here (Field Peas to Foie Gras) will serve you beautifully with the upcoming holidays. The Southern recipes in this cookbook will make Thanksgiving, Christmas Eve, Christmas, New Year’s Eve, New Years… and the entire year that follows even more delicious. I’ve already bookmarked the Old-Fashioned Sweet Potato Pie (page 159) and Cranberry Orange Relish (page 20) for Thanksgiving and the Black-Eyed Pea Salad will be a fresh and delicious way to ensure good luck on New Year’s Day! I also bookmarked the Blackberry Cobbler to make as soon as absolutely possible! It is, however, perfectly easy to substitute the non-gluten-free ingredients with gluten-free ingredients. With all of the gluten free flours on the market today, it’s simply not the issue it once was! Thank goodness because I can’t wait to try ALL of these recipes! Roasted Turkey – With everything you need to know to cook the perfect Thanksgiving turkey. The awesome recipes are accompanied by absolutely gorgeous pictures. The food makes you want to dive right it and I absolutely love the pictures of the author and her 2 beautiful daughters and 1 beautiful niece. Being a mom to daughters makes me, “Awwww” anytime I see other people’s daughters. I guarantee you’ll love everything about this beautiful cookbook. It’s a perfect salute to Southern cooking and what makes is so unforgettable. Chef Jennifer Hill Booker Le Cordon Blue-certified chef, cookbook author, reality TV personality, culinary educator, business owner and GA Grown Executive Chef for the GA Department of Tourism and Travel discovered her passion for food early in life. As a little girl cooking beside her mother, grandmother and aunts she learned that through food she could touch people’s hearts and bring smiles of happiness. 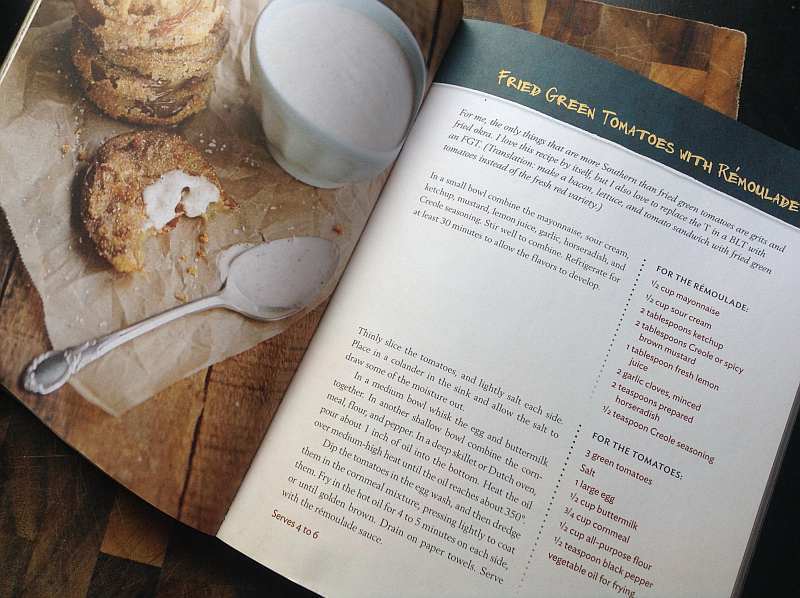 Chef Jennifer spends her free time in her kitchen, garden, or the local farmer’s market. She currently resides in Lilburn, Georgia with her two daughters Jenelle and Regine along with their KorgieJack, Pudge. 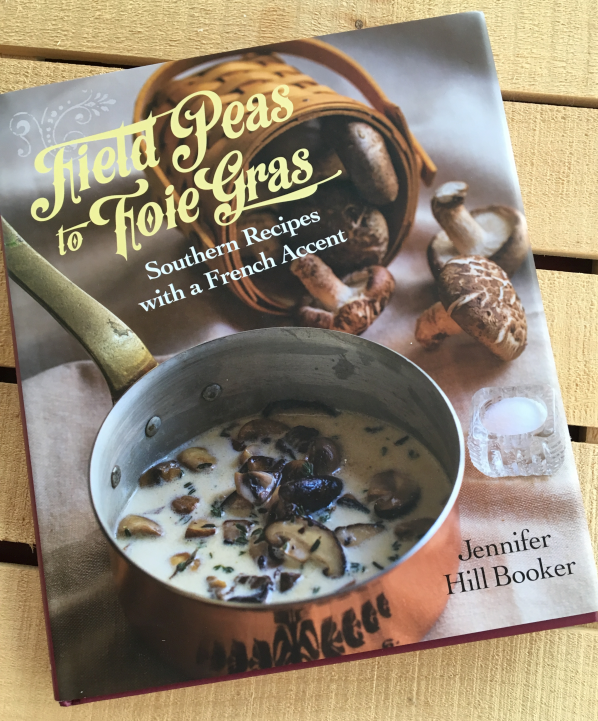 See Field Peas to Foie Gras for more information. This one is a perfect 10. I love coleslaw on the level some people love cheesecake. Not that I wouldn’t, at any given time, wrestle crocodile in a bad mood for cheesecake. Over the years, I’ve played and tinkered with coleslaw recipes – adding this, adding that, leaving this out, leaving that out… you know, tinkered. In the end, the one that remains my favorite is the simplest. I, for personal reasons I can’t even begin to explain, prefer my coleslaw coarsely chopped as opposed to shredded. I know. Weird, right? But, there you have it. Maybe it’s because I like it crunchy and snappy. 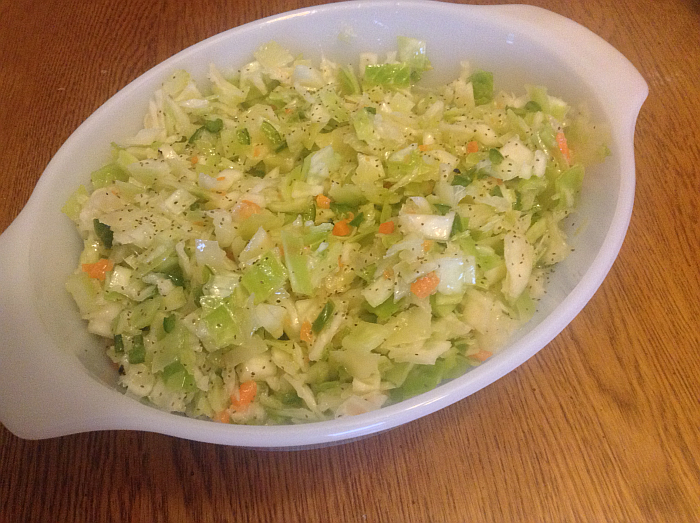 I grate my carrots, but finely chop the cabbage and green bell pepper. My husband teases me about the amount of time it takes for me to make a batch of coleslaw, but I’m never more relaxed and at peace with life than when I’m cooking, so it’s all good. After you’ve poured the cooled mixture over your vegetables, whatever you do, don’t pour out what you think to be “excess” liquid – that’s where the flavor lives! Bring sugar, oil, vinegar, salt, and celery seed to a boil in a saucepan. Cool. Pour sweet mixture over vegetables and combine well. The most recent cookbook I was sent to review has turned out to be one of my all-time favorites. The Southern Bite Cookbook: 150 Irresistible Dishes from 4 Generations of My Family’s Kitchen by Stacey Little is the next cookbook you’ll want to buy. Trust me. 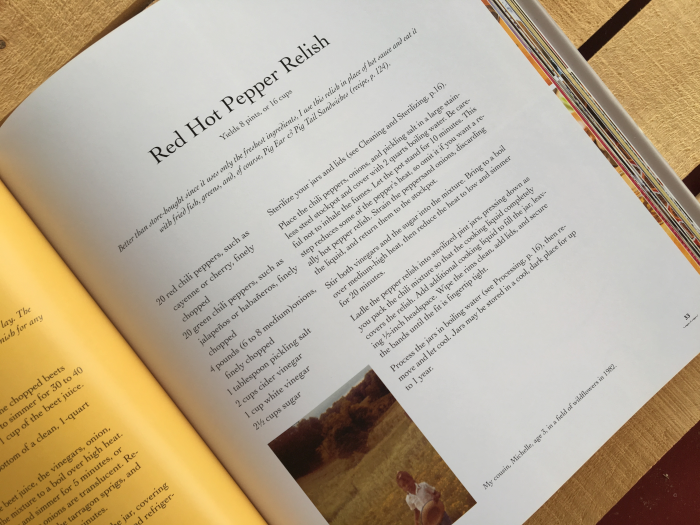 This one’s everything you want in a cookbook – from recipes you’ll actually make (as in time and time again) to ingredients you often have on hand, The Southern Bite Cookbook will become your constant companion in the kitchen. My favorite cookbooks are the ones where the author’s personality comes shining through. When reading the pages FEELS like you’re sitting around the table chewing the fat with the author as opposed to reading someone’s words you’ve never met. 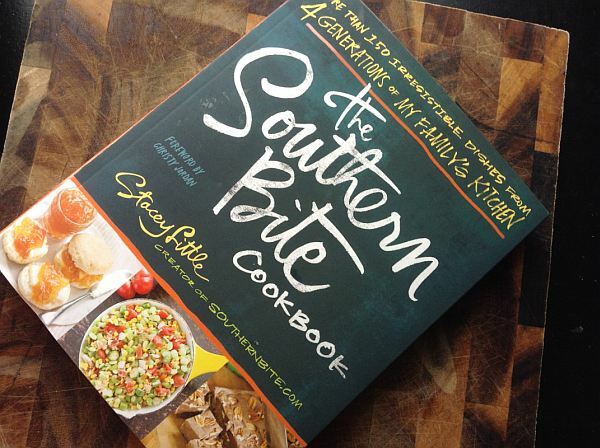 The Southern Bite Cookbook is a perfect, perfect, perfect example of this kind of cookbook. Who is Stacey Little? Well, to start with, as the back cover says, “Stacey Little gives Southerners a good name.” Stacey is an Alabama boy (just like my youngest son-in-law) with a popular food blog (Southern Bite). He lives with his beautiful wife, ridiculously adorable son, two dogs, and a collection of cast iron skillets in central Alabama. The most important thing you need to know about Stacey, however, is that the boy knows good food. If we’re lucky, he’ll give us many more cookbooks over the coming years…. I’d buy them all. The Southern Bite Cookbook: 150 Irresistible Dishes from 4 Generations of My Family’s Kitchen includes many of Stacey’s warm and wonderful stories about growing up in the South. As a Southerner (Kentucky), myself, the stories resonate with the area I love so much. Southern hospitality, the value placed on family, the faith in a wonderful God above, and the love of great food pretty much define the South and this cookbook is a beautiful homage to the definition. I’ve found that the kitchen holds a sense of comfort for me like no other place. Some of my earliest memories are sitting on the floor of my grandparents’ kitchen, pulling out all of my grandmother’s pots, pans, bowls, and spoons, and cooking up a storm. The kitchen is my place to be. I never grow tired of the comfort it provides me. Review Continued below the picture. I’d think these same words over and over and over again throughout the book. In addition to the stories and fantastic recipes, you’ll find plenty of beautiful pictures throughout the book. Are the recipes easy enough for a beginner? Are the steps clearly defined? When appropriate, is there a wide variety of food and recipes included? Do the recipes look/sound like they’d be tasty? Are they recipes the reader would use again and again and again? 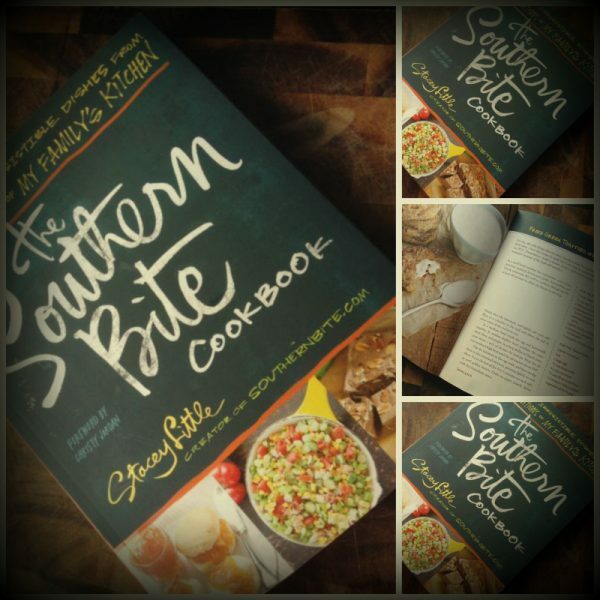 The Southern Bite Cookbook: 150 Irresistible Dishes from 4 Generations of My Family’s Kitchen gets Straight A-pluses on my report card…. plus a raving, gushing “note” on the back. Okay, there are TONS more, but I have to stop. I’m legitimately getting too hungry to concentrate. I don’t want to keep you for another minute – I desperately want you to head over to Amazon and grab your own copy right away. The cookbook is also available for Kindle…. either way time with Stacey is time well – and deliciously – spent. 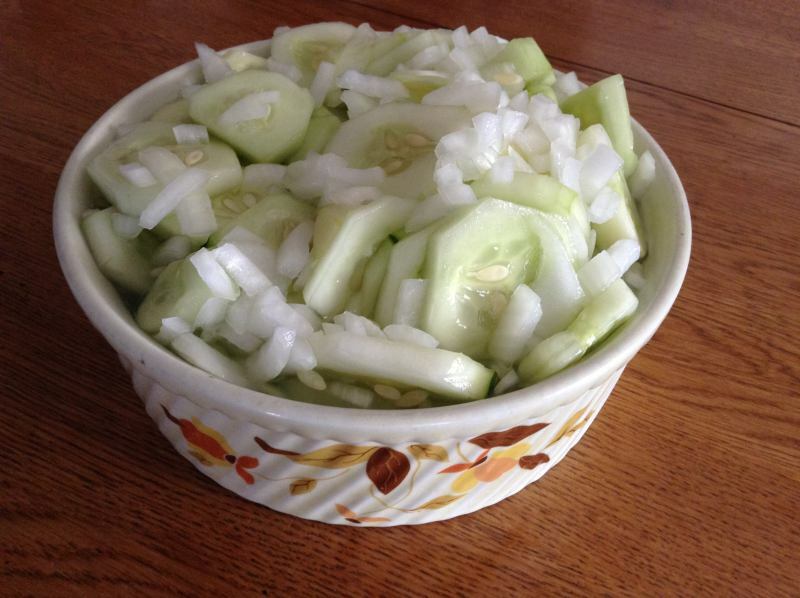 There’s just nothing quite like a fresh Cucumber, Onion, and Vinegar salad, is there? The flavors and aroma conjure up summers gone by as they help you embrace the one you’re currently living in. 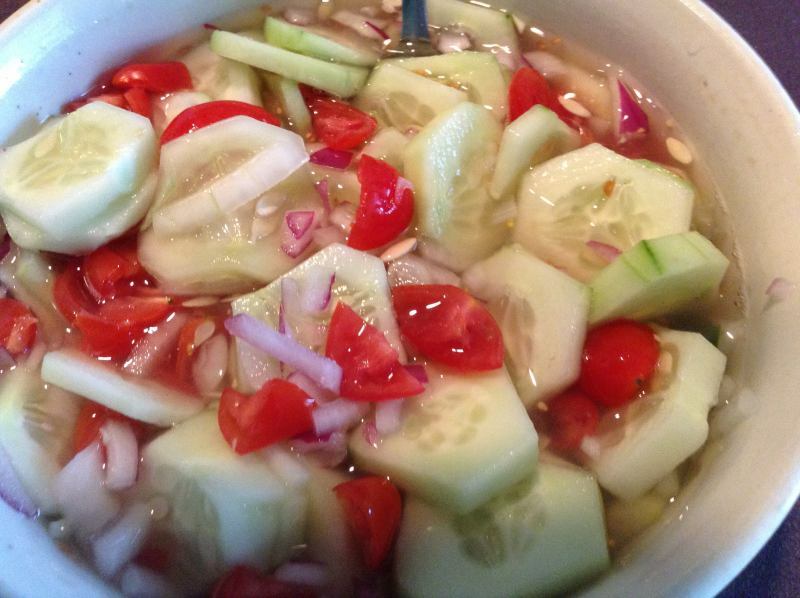 My mom, aunt, and grandmothers on each side all made great Cucumber, Onion, and Vinegar Salads. Each somehow tasted a little different because each tended to be either heavy or light-handed with sugar. My aunt’s version wasn’t as sweet as my grandmothers’ salads and none of the three COMBINED were as sweet as my mother’s! 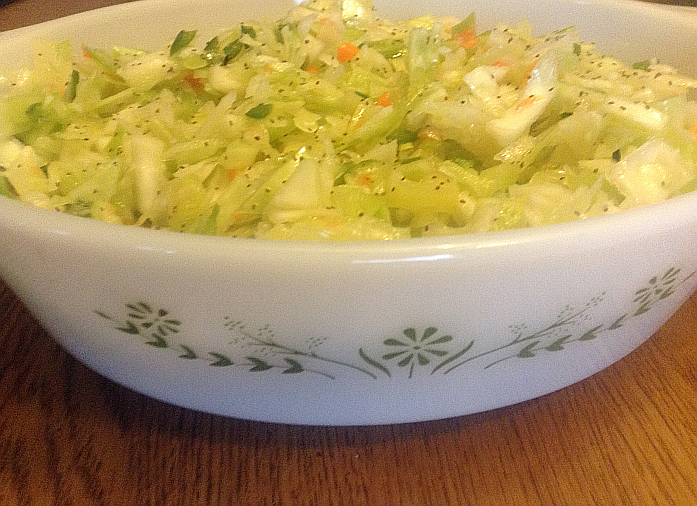 Because this is such a nostalgic recipe, I always serve this salad in a family “heirloom” bowl. It just sort of sweetens the deal, if you know what I mean. The bowl shown here is one I remember my mom using time and time again. She loved dishes SO much – honestly, she’d get more excited about bowls and plates than she would what was in them. Suffice to say I do not carry this gene. Peel and slice the cucumbers. Combine the cucumbers, chopped onions, and the rest of the ingredients. Cover and refrigerate until needed. This is one of those recipes that, over time, you’ll adjust to your own personal tastes. Some people add a minced garlic clove to their Cucumbers, Onions, and Vinegar Salad. My husband likes chopped grape or cherry tomatoes in his (pictured below). I’m pretty old school, though, and much prefer the original cast of characters. I have, however, been tempted to add chopped jalapeno or green bell pepper to play with the flavors a little. 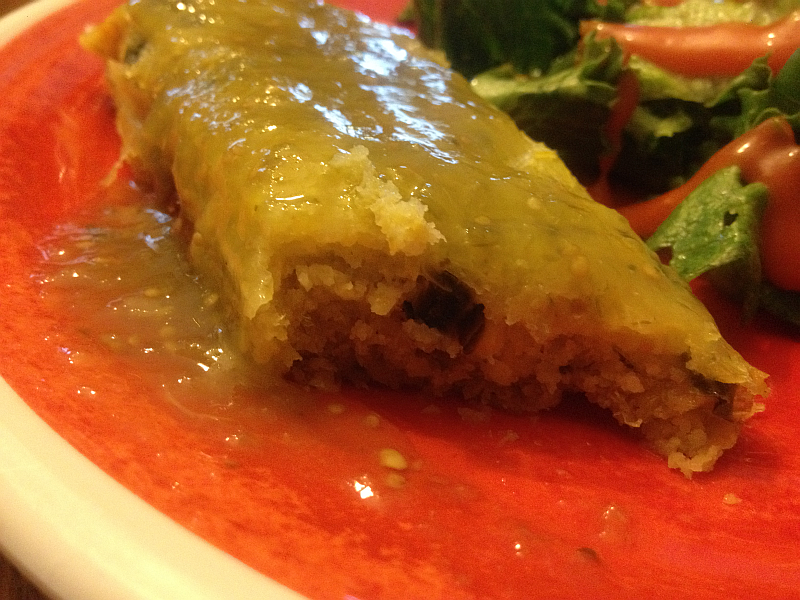 Salsa Verde is Delicious on SO Many Different Things! You’ll frequently see salsa recipes and salsa love on this food blog. Why? This food blogger is, how do you say, freaking obsessed with salsa! I mean, seriously, there are so many variations and each tastes fresh and fabulous. What’s more, salsa can be as healthy as you want it to be. Mediterranean cooking is known to be incredibly healthy and some of the main components of a Mediterranean Diet are right there in salsa: Tomatoes, garlic, peppers, onions..
Nutritional expert Joy Bauer even suggests using salsa as a substitute for creamy dressings on sandwiches. Been there, done that, and called it Heavenly. I even replace salad dressing with salsa a most of the time – it ups the vegetable ante while keeping out unwanted fats and calories. I can’t wait to find tons of ways to enjoy the Salsa Verde recipe below. It’s from KRUPS, so I know it’s a knock-out. Rinse the tomatillos under cold water. Put them in a pot and cover them with water. Bring to a boil, over medium heat. Reduce the heat and simmer uncovered, until their color has changed and they are cooked and soft but not falling apart, about 10 minutes. Add the tomatillos to the blender along with the chili, the garlic clove and a teaspoon of salt. Puree until smooth. Stir in the chopped cilantro and onion. Taste for salt and add more, if necessary. Pour into a serving bowl. Why Your Kitchen Needs the Neelys! One of my favorite series on The Food Network is Down Home with the Neelys. They’re a warm, lovely, hilarious, and charming couple who happen to cook up a storm. Or two or twelve or twenty. If you’ve never caught the show, do yourself (and your culinary skills) a favor: Check your local listings and make the Neelys daily guests in your home. You’ll fall instantly in love with them – trust me. If, like me, you’re already a true blue fan, you understand why I’m singing their praises. Their food is right up my southern alley. New fans and old fans, alike, will want Pat and Gina on DVD. In Food Network Down Home with the Neelys: Season 1 , the Neelys teach you their favorite family recipes, foolproof dishes for entertaining, and delicious tricks of the trade. With more than fifty recipes on the entire first season’s thirteen mouth-watering episodes, nobody will leave the table hungry! 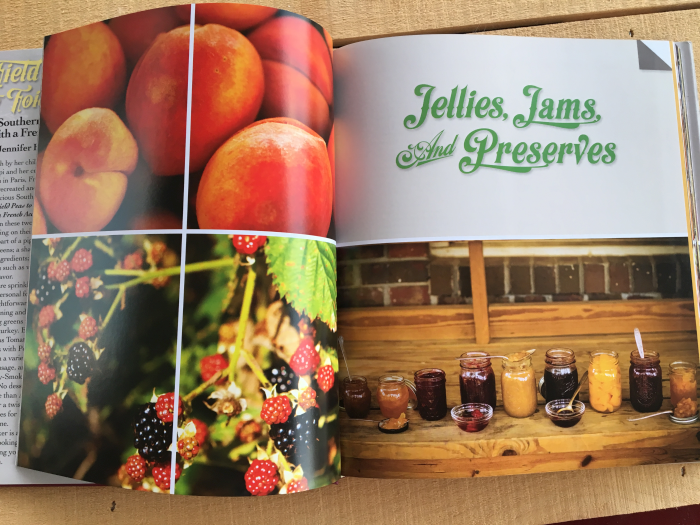 If cookbooks are more your thing, you’ll want to add Down Home with the Neelys: A Southern Family Cookbook to your collection as soon as possible. Either way you go about it, getting to know the Neelys will add a lot of style, fun, flavor, and southern sass to your cooking. Now tell me that’s not a good thing. I mentioned a few posts back that I’ve kind of gotten stuck in Steamed Asparagus with Hollandaise sauce Heaven. Not that there’s a single solitary thing wrong with this delectable dish – but I’d been wanting to try a new dance step with asparagus. So, I did just that a couple of times this week. Baked Asparagus: Wednesday night, I baked asparagus. I washed the fresh asparagus (about 1-1/2 pounds), and snapped off the tough ends. I laid the asparagus down – with sides not touching – in a baking tray (a shallow cake pan is fine). I sprinkled the stalks with olive oil, salt, freshly ground pepper, chopped parsley (about 2 tablespoons), and garlic powder. Then I baked them just until the asparagus was tender – a little over 5 minutes. Cast Iron Skillet Asparagus. Sunday Night, I used my cast iron grill skillet. I let the iron skillet heat up (to a medium-high temp.) while I prepared the asparagus (washed, trimmed). Then I brushed olive oil onto each stalk before placing it into the skillet. I seasoned the asparagus lightly with salt, pepper, and garlic pepper. I turned the stalks over after a few minutes, lightly seasoning the newly exposed side. At this point, I added a small amount of water to the bottom of the pan. The water created a lovely little sauna for the seasoned asparagus and, in no time at all, they were ready for the platter. When I removed them to the platter, I lightly squeezed a little fresh lime over the glistening beauties. Notice I say “lightly” seasoned? The reason for this is the fact that cooking with cast iron gives you an outrageously amazing flavor that I frankly don’t want to mess with. Because of this incredible flavor, you can bypass the extra calories that come with many sauces, seasonings, and spreads (sigh, even Hollandaise Sauce). If you’re an asparagus fan, you seriously have to try this technique – it’s outstanding. It’s tough to give exact times when giving vegetable recipes such as these simply because people like their vegetables cooked differently. I prefer mine to retain a little crispiness, while others like for them to collapse under the weight of a fork. As always, just stay close by and test for yourself when you think your vegetables (in this case asparagus) are done. Another tip: You might even want to use one asparagus stalk as a guinea pig. Take him through the motions and see how much, if any, seasonings you think are necessary. I SWEAR, cast iron magically creates its own flavor and seasonings. 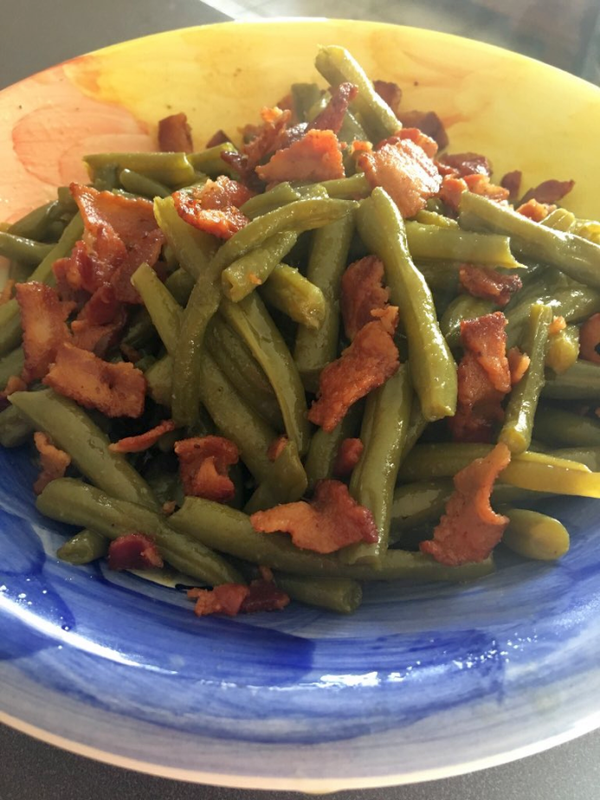 After taking my single stalk through the motions, I realized it was delicious as it was but that I wanted to experiment with more seasonings…. lightly. I can’t wait to try asparagus recipes (as well as other vegetable recipes) on the grill. Grilled asparagus, grilled corn, grilled bell peppers, grilled mushrooms – all served alongside an orzo/rice combination makes my mouth water and my heart beat a little faster. What a tasty summer this will be! 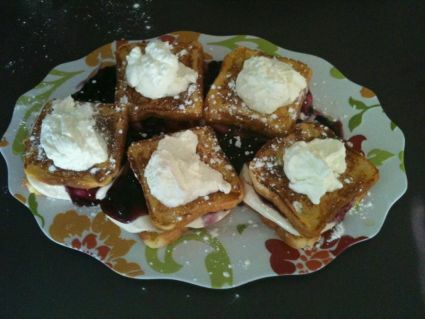 The beauty at the top of the post is the Le Creuset Enameled Cast Iron Cobalt Square Grill Pan 10.25-in. . This grill pan, which will soon become your best friend in the kitchen, is available through Amazon. Click the link for more information.